Congrats to Peter Rich on his 1st place finish in the Annapolis NOOD! 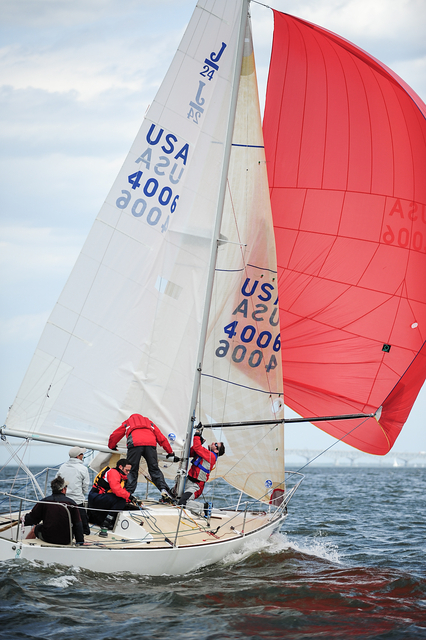 Strong westerly winds on Chesapeake Bay delivered favorable racing conditions for sailors competing in the final day of the Sperry Top-Sider NOOD Regatta Annapolis (held May 2-4) where seven area J/24s duked it out in seven races. Local Peter Rich won the J/24 fleet with all top-three finishes (including three bullets) for 14 points. Just one notch behind was Pat FitzGerald’s Rush Hour of Baltimore, MD with 15. Pete Kassal’s Spaceman Spiff, another Annapolis boat, placed third with 19 points. For complete regatta information, click here.